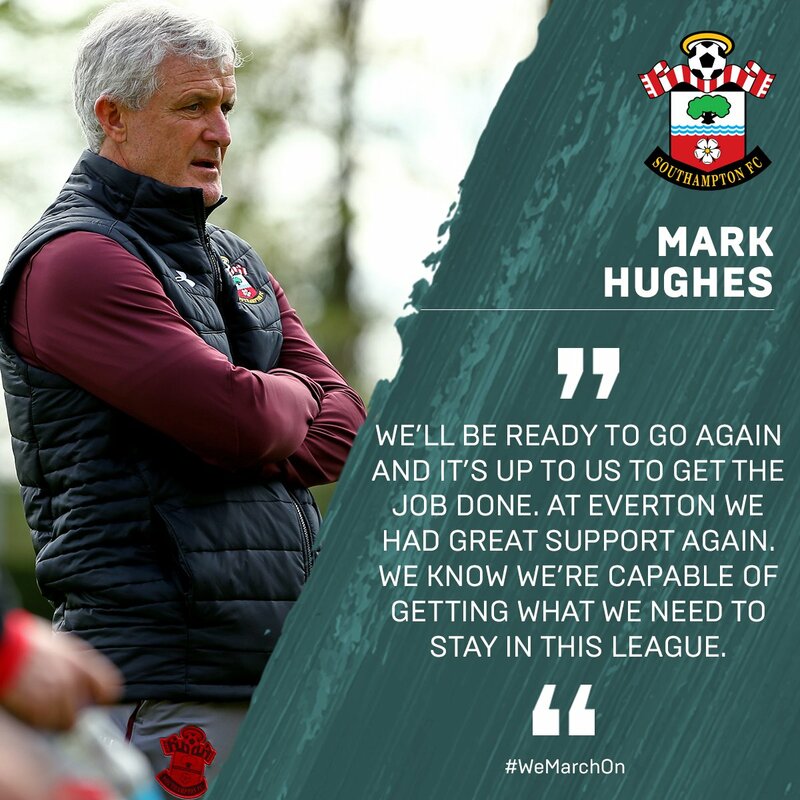 Hughes on huge role of Saints fans as survival edges closer. Full-back elated after taking a huge stride towards Premier League safety. Cédric on the spirit that helped Saints at Swansea. The best of the fan and player images after the 1-0 win at Swansea. The best of the images from a memorable night at Liberty Stadium. Watch the best of the action from Liberty Stadium. Stephens: “It was a grind"
Boss full of praise for players, staff and supporters after vital win. Boss speaks after dramatic evening in south Wales. Substitute scores only goal to put Saints on brink of survival. Swans boss Carlos Carvalhal on Tuesday's clash with Saints. All you need to know ahead of Tuesday's huge game. View our images from Monday's training session at Staplewood Campus. Boss insists Saints will not be "damaged" by Everton late show. Need-to-know information before you travel to south Wales. Watch the boss preview Tuesday night's huge game. Get the lowdown on Saints' next opponents from a Swans expert. See if you can get ten out of ten in our pre-match quiz. Gabbi's scrambled finish has won it here but the job is not 100% done yet. Still, fantastic full-time scenes in south Wales as Gabbi's late goal has earned a monumental three points. YESSSS!!!!!! IT'S ALL OVER IN SWANSEA!! Ki's whipped free-kick reaches Abraham in the middle whose firm header needs to be tipped over by McCarthy. Good save from the keeper but the flag was already up for offside. A standing ovation from the visiting supporters as Sam McQueen sprints on to take the place of Tadić. Tom Carroll on, Andy King off. What a huge goal that could be for Saints. Swansea react by making an attacking sub of their own. Luciano Narsingh on for Naughton. UNBELIEVABLE! Saints lead!!! Fabianski keeps out Austin's shot at point-blank range but Gabbiadini is there to somehow bundle home in the six-yard box. YESS!! No chance taken on the young Pole. Manolo Gabbiadini is on to take his place. Four at the back now for Saints. There's a break in play at Liberty Stadium while Jan Bednarek receives treatment for a collision with Alex McCarthy. First switch for Saints as Shane Long takes the place of Redmond. An attacking switch here for the hosts as striker Abraham replaces full-back Olsson. Saints are starting to get Cédric and Ryan Bertrand into the game now. The pair combine to force a flurry of corners as the pressure begins to rise. Tadić collects the ball on the half-turn and feeds Austin who recovers from a sloppy first touch to arrow a shot into the body of Fabianski from distance. Saints struggling to get a hold of the ball at the moment. This is a stunning save from Alex McCarthy. 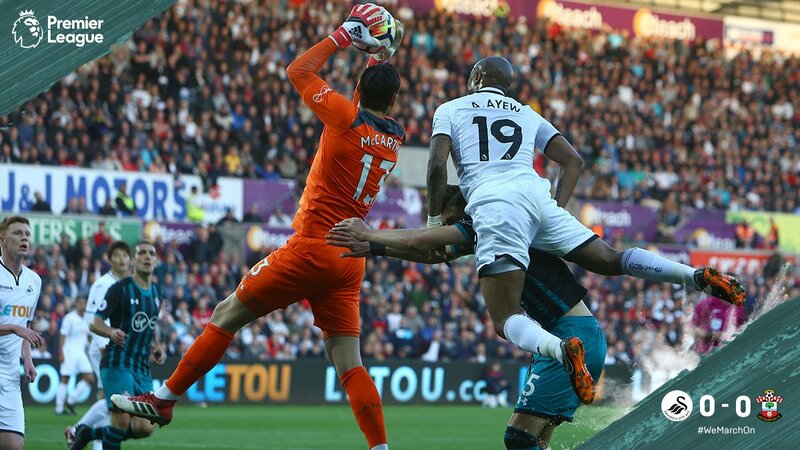 Jordan Ayew darts inside from the touchline and curls for the far corner but the Saints keeper is equal to it, acrobatically flying to his left to palm over the top. Back to it in south Wales, COYR!!! Tension wherever you are as a Saints fan tonight. The second half is coming right up from the Liberty Stadium, with both sides unchanged. @SouthamptonFC We’ve had the better chances but we have to push a bit harder to take control and go for the win! A draw might not be enough. Swansea have had the physical edge in south Wales but the best chances have both fallen to Saints and Charlie Austin. Everything to play for after the break. Brilliant pressing from Saints carves out a really good chance for Chaz! Cédric pounces on a loose ball and crosses to the back post where Austin's firmly-struck volley is hit straight at Fabianski. Saints under pressure here as we approach the 40-minute mark. Romeu goes into the book for a lunging tackle near the halfway line. Swansea have looked to cross the ball at every opportunity and they almost find a breakthrough with one of the better ones from the right. Sam Clucas darts into the box to glance a header wide of the far post. Plenty of nerves on show at St Mary's where Saints fans have gathered to follow a live showing of tonight's game. Concern on their faces here but there's very little separating the two teams so far. Much better from Saints. Højbjerg steps onto Redmond's lay-off inside the centre circle to feed Austin whose low drilled effort is well-held by Fabianski. Austin should be doing better here. Saints turn over possession in the middle of the Swansea half and suddenly have a 3-on-3. Redmond feeds it into the striker who drags a shot wide with Tadić well-placed and on the move to his left. Swansea recycle the ball as Saints struggle to clear. Ki loops it back into the danger area for Jordan Ayew to head over the top under pressure from Hoedt. Jordan Ayew is looking bright for Swansea. The Ghanaian races onto a long ball into the channel, stands up Cédric and crosses deep towards the back post but Saints' McCarthy is at hand to punch clear. First booking of the night goes to Sung-yueng Ki. The South Korean takes away the legs of Højbjerg with Saints looking to break quickly. 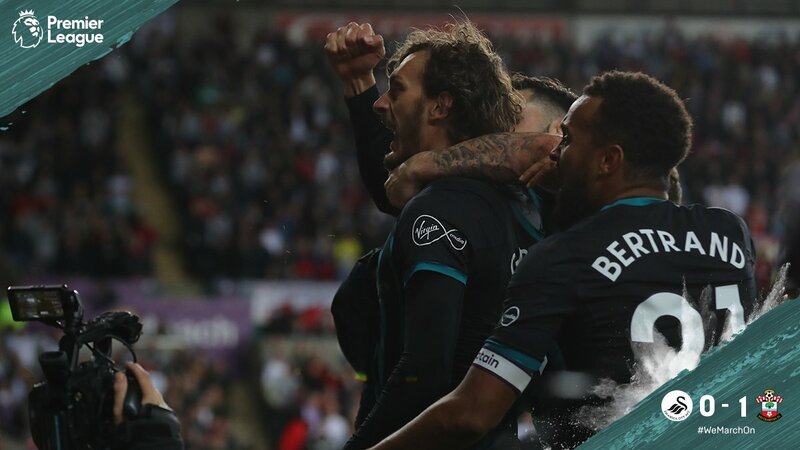 Plenty of ball now for Saints who are starting to find their feet at the Liberty Stadium. Højbjerg's pass into Redmond is intercepted by Naughton as another spell of promising build-up is cut short. Half chance for Swansea; Ayews Jordan and André combine neatly on the edge of the box but Wesley Hoedt and Jan Bednarek converge to deny the latter on the slide. The home side return in kind, Andy King stabs a shot goalwards from distance but Alex McCarthy gets down comfortably to gather the ball. A first shot on target! 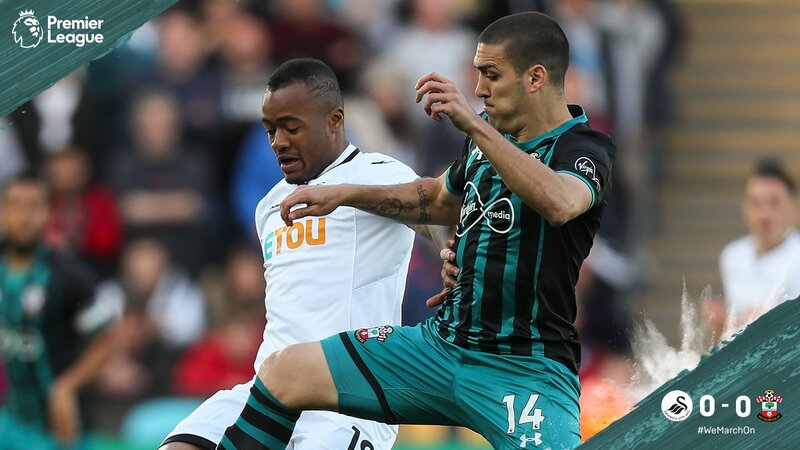 Redmond's persistence keeps the pressure on for Saints but the attack comes to an end as Ryan Bertrand's tame low shot is easily saved by goalkeeper Fabianski. Saints have settled the quicker of the two sides, you have to say. A first feel of the ball here for Dušan Tadić whose clever backheel releases Cédric down the right but the cross is headed clear by Swans' Alfie Mawson. Energetic start here at the Liberty. Swans have the first sight of goal as Jordan Ayew's free-kick from just outside the box bounces off the Saints wall and away to safety. Warm-ups well underway now in south Wales, 20 minutes until the biggest 90 minutes gets started. "We are looking forward to the game, we are ready. We want to win this game and we are well prepared. We can do it." Saints XI to face Swansea: McCarthy; Cédric, Bednarek, Stephens, Hoedt, Bertrand; Redmond, Højbjerg, Romeu, Tadić; Austin. We have a full complement of Saints in south Wales. Here are the scenes as Mark Hughes's men headed in moments ago. 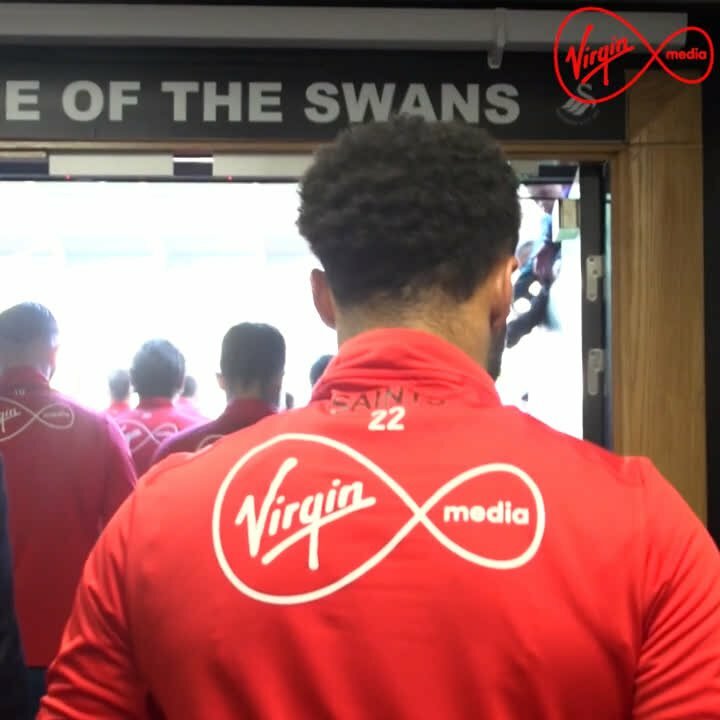 Saints have arrived at the Liberty Stadium ahead of tonight's critical encounter which means just one thing: team news will be coming your way in just under half an hour's time. we've got two games left and everybody is writing the man city one off. we'll give that one a go as well, but clearly this is the one that will really decide our fate. The final countdown is well and truly on. Get up to speed ahead of Saints' arrival at the Liberty in 30 minutes with our in-depth match preview. – Only one of Saints’ last five top-flight trips to Swansea has ended in defeat, with three wins and a draw in that run. – Swansea’s current winless run (7) is second only to Stoke’s 13. (Still) ready and waiting here too. @SouthamptonFC We are on are way up to the game. We can do this we are in . Coach number 1. 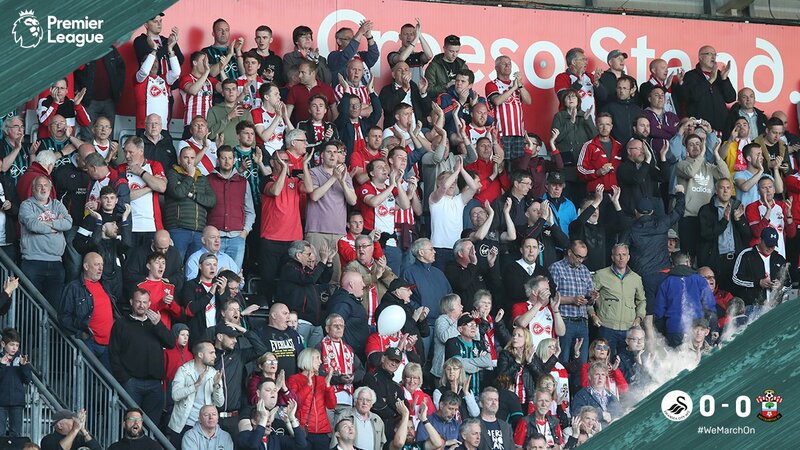 Around 2,000 Saints are expected in a sold-out away end at the Liberty Stadium. A lucky few will be at hand to roar us on as thousands more watch on from around the world. Hundreds of fans will be checking in at St Mary's for a pre-match dinner and live screening so watch out for updates from closer to home too throughout the night. Shane Long was the hero in south Wales in the 2015-16 season, the Irishman's second-half header setting up a 1-0 win in February. it gives us faith: listening to the fans out there gives us even more. they believe, we believe and together we can go on to secure our premier league status. It's been a quick turnaround for Saints following that dramatic (and heartbreaking) 1-1 draw with Everton. Here's what Mark Hughes had to say of this evening's clash from Goodison Park on Saturday. They don't get much bigger than this. 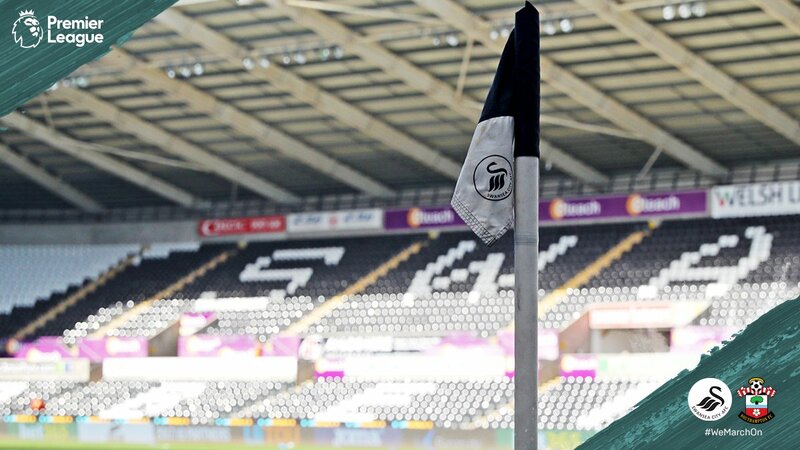 It's Swans vs Saints, 18th vs 17th, a do or die battle at the Liberty Stadium tonight. A win for either side would go a long way to decide who stays in the Premier League. We're just under three hours from kick-off so don't go anywhere; stay with us for build-up, live team news, in-game updates and live audio commentary. COYR.